You’re the first on the scene of an accident involving a biker. Do you know what to do? Would you know who is most at risk? How to protect the area? Or whether you should remove the helmet of a downed rider? 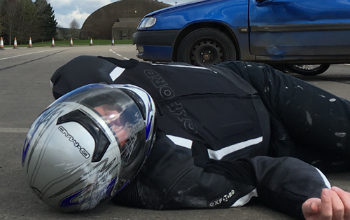 Attend a FREE Biker Down workshop to learn the practical skills of what to do if you are first on scene at a crash involving a motorcyclist. It’s delivered by firefighters from Oxfordshire Fire and Rescue Service to participants at local fire stations in small informal groups (Ideally a maximum of 12). The workshop lasts around 3 hours. It covers accident scene management and motorcycle specific first-aid training. When and how to remove a helmet and the science of being seen. The course is aimed at motorcyclists of all ages and experience. Pillion passengers and drivers are also welcome. If you would like to book a place on one of our workshops email BikerDown@oxfordshire.gov.uk. It’s strictly a first come first served basis and we will confirm your place on the course by email. Want to attend a workshop but can’t make these dates? Follow us on Facebook or email BikerDown@Oxfordshire.gov.uk and let us know you would like to go on our next workshop mailing list. We're happy to run workshops for biker groups for groups of friends. All you need to do is find 12 people who want to learn what to do if they were first on scene of a Motorcycle crash and get in touch. If you have attended one of our workshops your feedback is most welcome you can leave it on our Facebook page BikerDownOxfordshire or email BikerDown@oxfordshire.gov.uk. Good or bad we would love to hear from you. Also if you have needed to use your skills at an incident please let us know. If you live outside of Oxfordshire and would like to attend a Biker Down workshop, visit the Biker Down contacts page on www.kent.fire-uk.org there's a list of all the Biker Down's around the country. Biker Down was established by Kent Fire Bike - Kent Fire and Rescue Service.